Here's something you might not know about me: I love Dolph Lundgren. From his early appearance as He-Man in the ill-received Masters of the Universe feature film adaptation through Rocky IV and right on into the salad days of early '90s action movies, Dolph has been a constant presence in my movie fandom. A lot of folks think that Lundgren--as well as his frequent co-star and action icon peer Jean-Claude Van Damme--mostly slowed down when the crazy action flicks of the '90s evolved into more grounded and often cynical genre movies, but that's not the case. Both Lundgren and Van Damme have been working consistently in mid-tier Hollywood films (The Expendables franchise) but also in low budget movies from both America and Europe. Often, these movies are just as good as the stuff from the heyday of their career. To see some of Lundgren's direct-to-video highlights, I recommend little-seen movies like Missionary Man (2007), Command Performance (2009), and the awe-inspiring (seriously) Universal Soldier: Day of Reckoning (2012). But occasionally, these lower budget movies fall a bit short of the mark. Such is the case with Don't Kill It from 2016. I want to like this movie; it has a lot of elements that I enjoy, and walks the line between horror and action reasonably well. It even has a great premise: Lundgren is a demon hunter on the trail of a monster that can possess the bodies of whomever it so desires, using that body to carry out murderous rampages. The catch is that whoever kills the possessed individual then becomes the next host for the entity, and the cycle continues. This means that the demon is constantly hopping from host to host and cannot be destroyed, only transferred into a new victim. When this evil creature begins to terrorize a small town in Mississippi, Lundgren must face an evil that can't be defeated without putting the town at even further risk. Thus the warning: whatever you do, don't kill it. It's a great premise, and one that the movie gets a lot of mileage from. Unfortunately, other aspects of the production really let the film down. This frequently feels like a two-part episode of the show Supernatural, with Lundgren standing in for the demon hunting brothers Sam and Dean. In fact, I wouldn't be at all surprised to learn that the popular show was the main inspiration for this movie. Everything feels cheap and rushed. There's a mix of practical special effects and CGI effects, and the two methods yield completely different results. The practical effects, such as heads being bashed with axes and bodies being dismembered, looks gory and effective because it's tangible. The CGI effects are so cheaply done and look so bad that they wouldn't even be convincing in a video game. I understand why certain filmmakers decide to do CGI gore; it's cheaper than some elaborate effects shots and can be applied liberally scenes after the fact. But I always disconnect when I see digital blood and gore. Especially when those effects are Sharknado-level bad, which is definitely the case here. That brings me back to my television comparison. It doesn't help that the editor (who is also the director) uses every filter and effect in the editing suite. There's a sepia scene, there's a black and white scene, we speed up, we slow down, and there are quick cuts a-plenty (someone should open a salon under that name). I'm sure the editing tricks were used to give what was a modest production more punch and shine, but it actually has the opposite effect for me. Making matters worse is a script that doesn't seem finished. The main female lead in this movie is Kristina Klebe, probably most known to genre fans for the Rob Zombie 2007 re-imagining of Halloween and for 2013's Proxy. In this film, she's an FBI agent sent to this Mississippi town to investigate all the murders, but there's something special about her that attracts both the demon and Lundgren alike. Unfortunately, the movie doesn't adequately explain WHY, at least not to my satisfaction. A little research into the production history of the movie reveals that this project was very rushed, which is probably why it feels half-baked. After two postponements, the filming was completed in only 17 days on a 3.5 million dollar budget. I honestly don't know where the 3.5 million dollars went because nothing in the movie (aside from Lundgren) looks like it cost any money at all. At any rate, Klebe was cast FOUR DAYS before filming began. Maybe that's why it all feels so much like work for hire. But with all these negatives out of the way, I can say that Don't Kill It is not without charm. There's a sly sense of humor that occasionally rears its head, such as in a scene where a street Santa gets wasted (the movie takes place at Christmas, though this is rarely mentioned or utilized) and during one of the big action scenes inside a town hall meeting. Dolph Lundgren is always watchable no matter what he's in, but he really seems to be having fun here. It's a role that could be iconic under the right conditions, and he plays the demon hunter with a mix of weariness and wry wit. The character dresses with the sort of rock and roll gypsy panache that would make both Keith Richards and Johnny Depp proud, and he carries a gun filled with rubber bullets. I'm willing to cut this movie a little bit of slack because it does entertain and it's got a lot of fun elements. Director/Editor Mike Mendez comes from an editing background, so it's weird I noticed how ostentatious the editing is in this movie. Mendez has worked on some really great, effective horror films, such as The Gravedancers from 2006, featured in the first series of "8 Films To Die For," aka After Dark Horrorfest. He directed a segment in the 2015 horror anthology film Tales of Halloween, which is another horror movie I really enjoy, though his segment is not among my favorites. Mendez is a capable and talented guy, so I'm going to chock up certain elements of Don't Kill It--like the extensive use of CGI and underwhelming script--to the tight production schedule. Dolph Lundgren speaks highly of his character and seems like he'd be willing to return should this become a franchise. Even word of mouth for the movie has been mostly positive, occasionally even effusive. While I can't quite get on board with the unrestrained praise, I'd be interested to see a sequel with Lundgren, but I would hope that any future developments would start with a great script and an attainable shooting schedule. 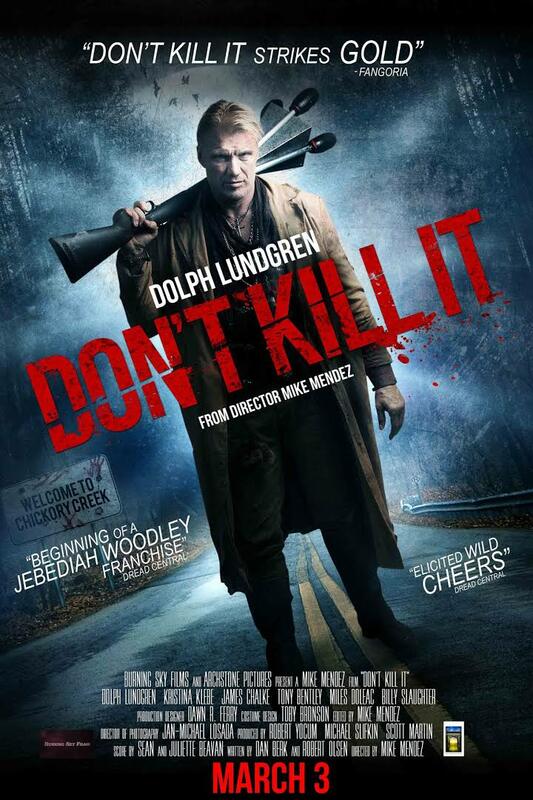 As it is, Don't Kill It is a middling horror/action movie with a few bright spots. It's great for lazy weekend entertainment. 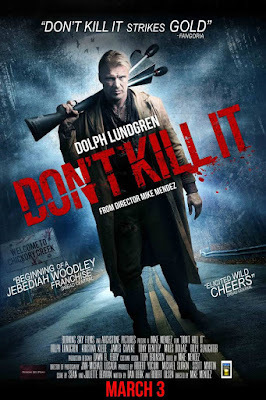 But with a star as charismatic and capable as Dolph Lundgren (soon to be thrust back into the Hollywood limelight with Creed 2), a compelling and original horror premise, and an unsettling, remote Mississippi location, I'm having a hard time not wondering what might have been.